Welcome to Among the Oaks in Pigeon Forge! 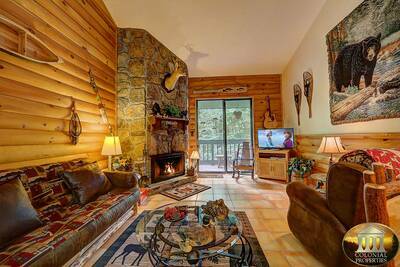 This wonderful 2 bedroom Smoky Mountain cabin rental offers exceptional amenities and total comfort while vacationing in the Smokies! This beautiful log cabin is conveniently located near downtown and all of the attractions, theaters, shopping and dining venues. With no steep mountains to climb and easy access, you’ll love being near all of the action. As soon as you enter Among the Oaks, you are greeted by natural wood tones and gorgeous picture windows that frame the outdoors. The spacious living room features a flat screen TV and a stunning mountain stone accented fireplace. 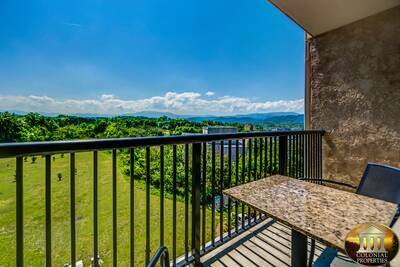 Located nearby is the fully equipped kitchen where you can prepare and cook your favorite meals while on vacation in the Smoky Mountains. The nearby dining room table can accommodate up to 6 people comfortably. There’s a relaxing main level king bedroom suite that features a TV and access to a full bath for added privacy and convenience. Venture upstairs and you’ll enter the spectacular loft game room. You’ll have countless hours of fun challenging your friends and family to an exciting game of pool! 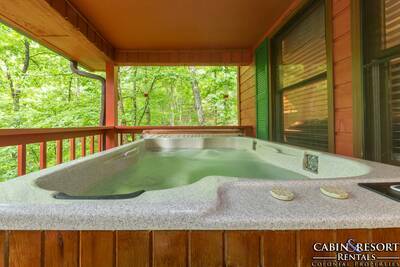 Also located on the upper level of this Pigeon Forge log cabin getaway is the amazing master suite. Here you’re treated to a king bed, fireplace, sitting area, TV, a soothing 2 person bedside jetted tub and a full bath. The front covered porch at Among the Oaks offers rocking chairs to take in the great outdoors while on the back deck you’ll find the bubbling outdoor hot tub, BBQ grill and additional rocking chairs for even more relaxation. In the warmer months, you’ll want to bring along your bathing suit and sunscreen so that you can take full advantage of the seasonal outdoor swimming pool that’s within walking distance. With its prime, in-town location, easy access, wonderful amenities and relaxing decks, Among the Oaks is the perfect place for your next mountain getaway. 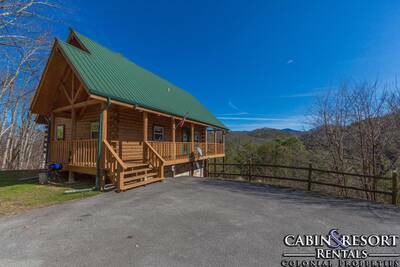 Reserve your stay at this Pigeon Forge log cabin today! A: Hi Crystal! Among the Oaks is located within Blackberry Ridge Resort. “ This cabin is in a great location. Accessible to the strip, easy entrance and very clean and modern. Would highly recommend this cabin for a great time in the smokies!! “ Beautiful cabin, excellent customer service from the staff! Hot tub was amazing. Perfectly wonderful experience! I highly recommend! “ Second year we have stayed in this cabin. Fits us just right. We will be back. “ I enjoyed the weekend and look forward to spending another vacation with colonial property everything was cleaned and the neighbors were nice. “ The view was beautiful. We were 5mins from downtown Pigeon Forge. Even my 8month old loved being there and enjoyed the view. 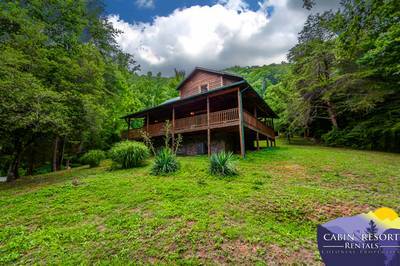 “ Great cabin in a great location! !